Prayer Cards are printed on 120Lbs Coated Silk Cover for a beautiful keepsake. Your prayer card will be beautifully unique, fully personalized with your own words, titles, and pictures making it a lasting keepsake for everyone. We can communication via phone, email and chat until your prayer card is perfect and ready for print. We will provide High Resolution PDF Print Ready Files in the following formats: Single Prayer Card With Bleed, Without Bleed and 8 Up on a page. This Prayer Card template is easy to edit yourself, or use our professional services to do it all for you. Since ALL text can be edited by you, this Prayer Card can suit any occasion. 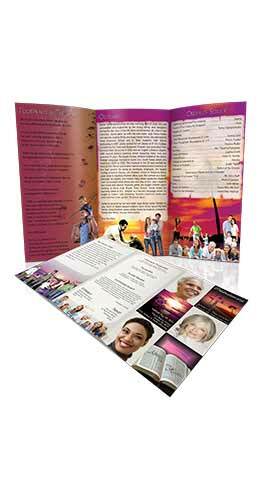 We offer all the help you need to make sure you have a beautiful prayer card to compliment your funeral program.